Bonita vivenda com piscina, sem prédio em frente. wifi. TV. 2 quartos com casa de banho, WC e jardim privado. Todos os quartos se abrem para a piscina. de limpeza 3 vezes por semana, jardineiro e piscina de manutenção 2 vezes por semana. Lençóis e toalhas mudadas 2 vezes por semana. Mercearia, restaurante, táxi, a 3 minutos a pé. Supermercado, compras nas muitas lojas dos famosos bairros de Seminyak (Legian) e Oberoi com seus locais e internacionais restaurantes, bares e discotecas, praias, cinco minutos de scooter ou táxi. A moradia é uma base perfeita para visitar e desfrutar dos arredores: O Templo do Mar, de Tana Lot, Ulawatu e macacos, spots de surf, Sanur, Ubud, a referência cultural da ilha e seu arroz terraços. Massagens e tratamentos de beleza nas proximidades. Mercados com produtos locais. Anna está à disposição para recebê-lo, informá-lo para que você tenha uma excelente estadia. Casa de banho com banheira abrir em plantações. We had an awesome time for our first visit to Bali. The villa was just as described and very comfortable, location very peaceful. Great communication with the villa owners and manager throughout the whole process, could not fault it. Every query I had was answered straight away. Good selection of restaurants near by, easy acces to taxis to get you around and only 10mins (by taxi) to seminyka village . Overall great experience and would highly recommend this accommodation. Thank you very much for your message. 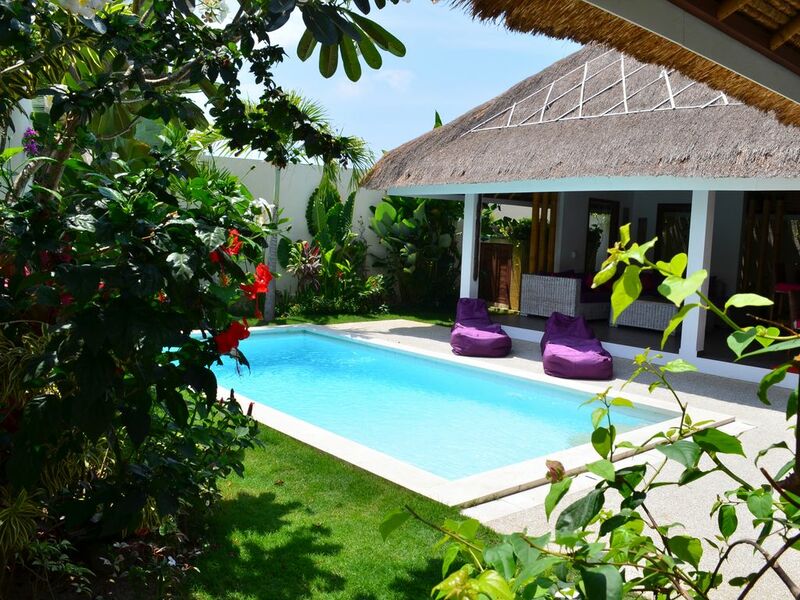 We are delighted that you had a pleasant stay at the villa and in Bali. We will be happy to welcome you again if you come back next time. Mooie villa op een goede locatie. We had a very nice stay in this very clean en great accommodation. Anna was very friendly and we had a warm welcome. Location was great but hard to find for taxidrivers. We gave the adres of the nearby situated hotel and walked the last minute. Thanks for having us in this beautiful house in a perfect, quiet, location. 15 jours de bien être ! Un vrai petit coin de tranquillité au milieu de la vie tumultueuse des balinais. Les photos sont conformes au bien loué. La literie des chambres est très confortable et nous avons adoré les salles de bains en extérieur. A proximité : laverie, salons de massages, magasins de première nécessité et petits restaurants. En conclusion : pas d'hésitation ! Perfect location, in-town assistant is kind and efficient, clean, beautiful private pool. The villa was a perfect place to spend a week in Bali. The location was quiet and peaceful, away from the hectic atmosphere of seminyak but also within walking distance to many of the area's best restaurants and shops. Taxis are very inexpensive to get to the beaches (less than $2 USD one way to go anywhere in seminyak/kuta/petitenget). The villa's helper Anna is an excellent concierge, reachable by SMS or WhatsApp for housekeeping requests, booking cars, renting motorbikes, etc. she always replied quickly. Owners are kind and communicative, easy to book. The bedrooms are the only indoor rooms with air conditioning -- fine with us but just keep in mind you will need insect repellent in the rest of the villa such as bathrooms, kitchen, and living area. Outdoor ceiling fans helped keep mosquitoes away. Villa includes a safe drinking water dispenser which was very useful and convenient. Nice supermarket walking distance. The pool was the real highlight -- clean and sparkling, sunny, and totally private with no one able to see in. There were sunny and shady areas to lounge around when not in the pool. Beds were comfortable and A/C was dependable and strong. We would return to this villa again! Very good value for the price. Thank you very much Christopher for your nice comment. We are glad you enjoyed the villa and had a pleasant stay. We wish you a good continuation in all your projects and will be delighted to welcome you again. Arrivée à partir de 14 h et départ avant 12 H sauf accord spécial.